Traditional education for engineers has shifted towards new methods of teaching and learning through the proliferation of Information and Communication Technologies (ICT). The continuous advances in technology enable the realization of a more distributed structure of knowledge transfer. This becomes critically important for developing countries that lack the resources and infrastructure for implementing engineering education practices. The two main themes of technology in designing e-Learning for engineering education in developing countries focus either on aspects of technological support for traditional methods and localized processes, or on the investigation of how such technologies may assist distance learning. Commonly such efforts are threefold, relating to content delivery, assessment and provision of feedback. 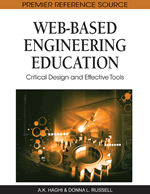 This chapter is based on the authors ‘10 years’ experience in e-Learning, and reviews themost important key issues and success factors regarding the design of e-Learning for engineering education in developing countries. Recent years have seen dramatic changes in engineering education in terms of increased access to lifelong learning, increased choice in areas of study and the personalization of learning. To advance across all domains seems to necessitate incompatible changes to the learning process, as practitioners offer individualized learning to a larger, more diverse engineering student base. To achieve this cost effectively and without overwhelming practitioners requires new approaches to teaching and learning coupled with access to a wide range of resources: practitioners need to be able to source and share engineering materials, adapt and contextualize them to suit individual needs, and use them across a variety of engineering educational models (Littlejohn et al, 2008). Hence a great deal of effort has focused on the integration of new technologies such as multimedia video, audio, animation, and computers, with associated software, to achieve the improvement of traditional engineering education. The internet technologies have also been popularly applied to web-based learning (Hung et al, 2007). The growth of the information society provides a way for fast data access and information exchange all over the world. Computer technologies have been significantly changing the content and practice of engineering education (Gladun et al, 2008). Information and communication technologies (ICT) are rightly recognized as tools that are radically transforming the process of learning. Universities, institutions and industries are investing increasing resources to advance researches for providing better and more effective learning solutions (Campanella et al, 2007). The most important aspects of a focused learning for engineering students is shown in Figure 1. Nowadays, the use of ICT has improved learning, especially when coupled with more learner-centered instruction, or convenience, where learning and exchange with the instructor can take place asynchronously at the learners own pace or on as-needed basis (Motiwalla, 2007). The consequent applications of all multimedia and simulation technologies, computer-mediated communication and communities, and Internet-based support for individual and distance learning have the potential for revolutionary improvements in education (Gladun et al, 2008). Hence, electronic collaboration (e-collaboration) technologies for engineers are technologies that support e-collaboration. An operational definition of e-collaboration is collaboration among different individuals using electronic technologies to accomplish a common task. These e-collaboration technologies include several Internet-based technologies, such as e-mail, forums, chats, and document repositories (Padilla et al, 2008).